Thanks for all your help so far. There is only one woman in the scene. I assumed (incorrectly) that it was Athena or Minerva because the name Britannia is scratched on the back of the shell. 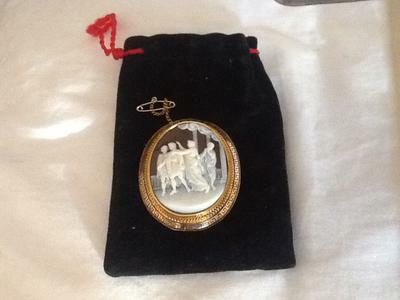 Return to Antique Cameo Help. 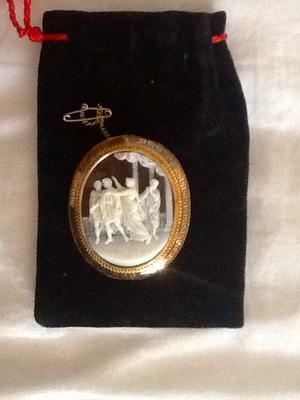 I recently inherited a cameo that belonged to my grandmother who had it passed down to her from a relative who went on the grand tour. 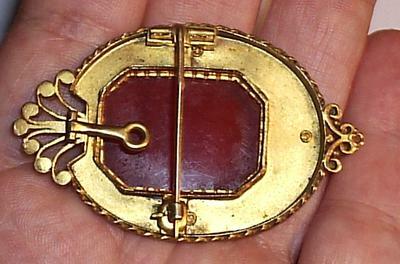 It is made of sardonyx and is bordered by a gold greek key design. It is not marked but tests as gold. 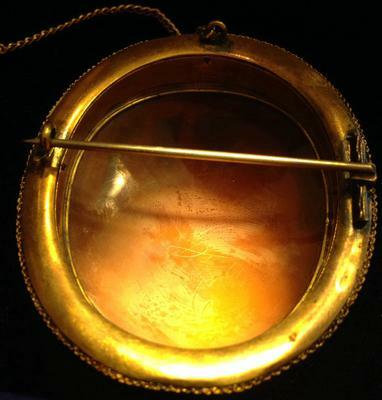 There is a scratched signature on the back along with the name "Britannia". The number 6 (underlined) also appears on the back of the shell. 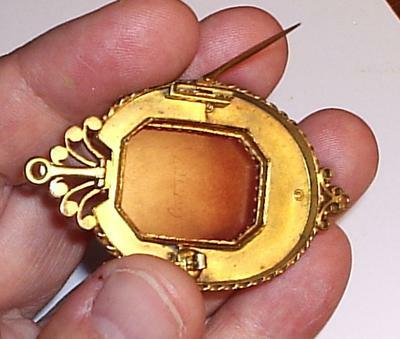 There are no scratches or cracks in the shell but I think that the c clasp pin has been replaced at some point. The carving is very white and high relief. 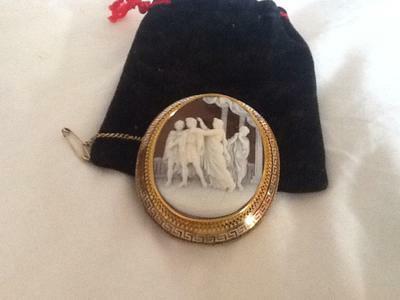 Can anyone give me an idea of what this classical scene represents? I'm assuming it's Athena or Minerva but I'm not sure who she's with. The figure closest to her may have a wreath in his hair. Any help with age, subject matter or value would be most appreciated. 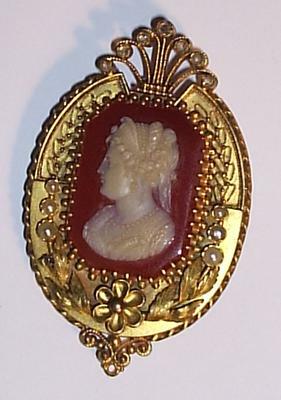 I have a beautiful cameo I'm trying to research, and I don't see anything else quite like it. Any info is helpful. 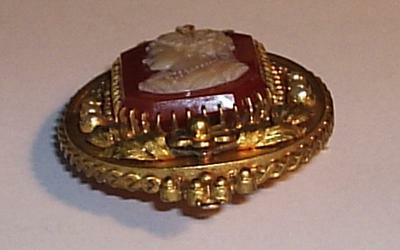 Brought it to a local jeweler and it is at least 14K, Diamonds and Pearls, and I think a Carnelian Cameo signed Cortese with a number. 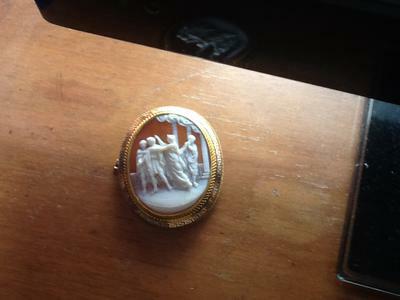 Is an Agate Cameo better than Sardonyx Cameo? 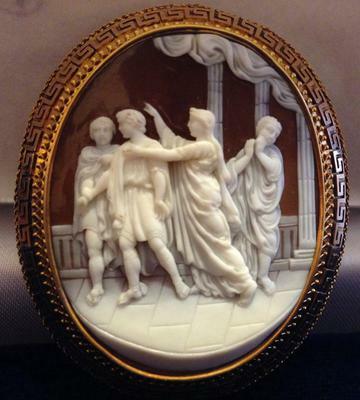 I have purchased some different types of cameo. I was wondering why the cameos made of sardonyx are so much cheaper then the ones made from agate. 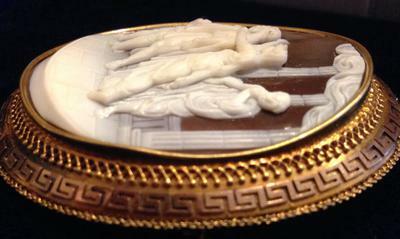 Are the agate Cameo better then the sardonyx?